There is a distinct difference between being a manager, even a senior manager, and being an executive and Scott Eblin in his book The Next Level: What Insiders know About Executive Success takes us through these differences. As Scott explains, some things that lead to the executive level need to go and other things need to be picked-up to be successful at this new level and beyond. He breaks these down into personal, team, and organizational aspects. One main difference is that an executive can no longer do or even check all the work but has to rely on his team—and allow them—to do the work. It is the difference between relying on your functional expertise and your leadership expertise. It is also the difference between being responsible for getting the work done or accountable for ensuring it is done. A big difference which many struggle with. Another related difference is that instead of directing how your team does the work, you need to direct the what and trust that they will get to your desired outcome in their own way. This requires having the right people in the right roles, which Scott also discusses. Scott interviewed many executives across industries and uses their quotes to "mentor" readers on how to make this transition. A great quote that he repeats a few times is that executives can't stay on the dance floor with their dance partner but need to get on the balcony to see the bigger picture and patterns. The executive can then return to the dance floor to execute on what he's seen. Have you had to make this transition or worked with someone who has? What made them succeed or fail in this? After reading and writing about Gillian Tett's The Silo Effect: The Peril of Expertise and the Promise of Breaking Down Barriers, I got to thinking about the internal silos we all carry with us. Gillian does mention how not revisiting classifications can lead to disasters such as the financial meltdown of 2008, but don't we all have our own labels? When was the last time you revisited what you think of yourself and your strengths? I'm probably unusual in the amount of time I spend thinking about this and in all the personality tests I take to shed more light on this, but even I have personal classifications (aka, internal silos) I probably need to bust out of. The one that comes to mind is "I'm not a salesperson." I'm not, really, but if you've read Daniel Pink's To Sell Is Human, than you understand that we all are. And I've actually held a business development role which I enjoyed more than I expected to and did far better at than I expected to. So perhaps I'm not the traditional type of salesperson that can sell just anything...but that does not mean that I cannot sell. And perhaps that silo has caused me to overlook opportunities in the past. Just today an opportunity to bust this silo came up and I'm considering considering it...so a step in the right direction but more work is needed. There is of course a fine line between internal silo-busting and forgetting one's strengths, so perhaps the answer is to widen those classifications or look at the circumstances in broader terms. Perhaps one needs to carefully weigh all the pros and cons to see if an opportunity is a bad fit or an internal silo. Do you have internal silos that need to be busted so that you can reframe how you see yourself? If you're like me, you often have many tabs open since you're either toggling between all of them or opening interesting links as they come up. And given that they hog computer memory and become annoying, you may have tried various methods and tools to get around this. You can save sessions. You can send links to your email and/or send them to Pocket or one of its competitors. You can also copy and paste urls to another page. But now there's a far easier and more seamless method that allows you to address all of this with one extension: Tab Snooze. As its name implies, you can actually snooze a tab. When you're on a given tab, just hit the moon in your Chrome extensions bar, select when it will reappear, and watch it disappear. You can also choose the check box at the bottom of the pop-up to get a to-do tab. This tab only has room for one to-do item and can be snoozed to reappear when you'll have time to tackle it...or re-snoozed until you actually get it done. 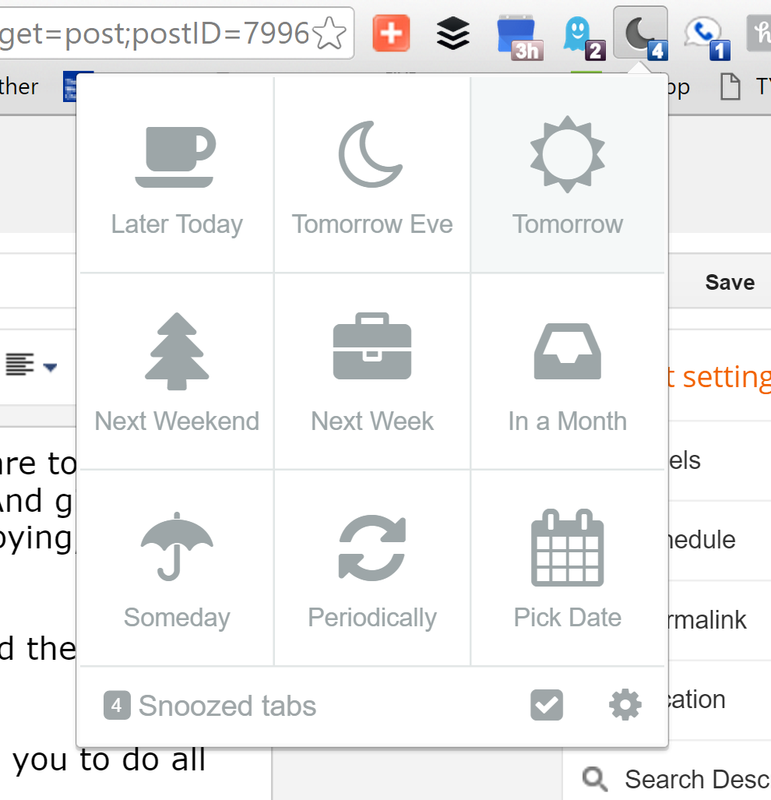 Tab Snooze is only available on Chrome for now (both web and phone/tablet versions), but you can sign-up to be notified when it will be available on other browsers. 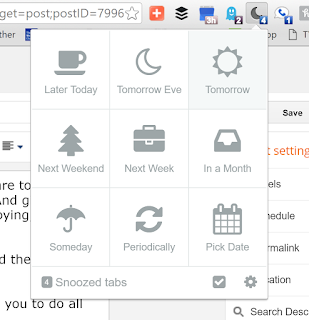 I now snooze everything but my Google Inbox tab since that's the only one I want open all the time. It's made my Chrome faster and me less distracted by the extra open tabs. Tab Snooze is also great for occasionally checking-in on things (e.g., a job board or eBay auction). If you decide to try the extension out, please let me know what you think and if you've discovered other ways to use it.